For more information on the Council nominations process and timeline, please follow this link. If you’re interested but want to know more about being a Council member, or standing for President, contact Glenn for an informal discussion. Nomination forms must be filled in and sent to glenn@britishchamber.be by 24 April 2015. I first joined the chamber in 2013 after attending the British Chamber Spring Networking cocktail. I had just come to Brussels after two years of studying at Cambridge and wanted to actively become a part of a British network, partly because I missed the link with Britain. I had a conversation with Glenn and Glynis during the cocktail discussing how I could become more actively involved in the chamber. Glenn suggested maybe running for Council elections that were happening 2 in months time. I had my doubts because I was new to the chamber and had no idea how to run an election campaign, so I asked if there could be any other way of getting actively involved. That’s where Glenn told me that the position of Secretary was available. I wanted to get involved with the British Chamber, not just because of the link with Britain, but I was also looking for an organisation looking to bring into contact both British and Belgian business. I also found interest in the fact that the chamber had the BNG and a strong SME-focus. There are many different committees and dedicated chairs, not just in EU policy but in Belgian-British business affairs too – it is this uniqueness that sets the chamber apart from the rest of similar organisations in Brussels who focus either on EU or national policy. I wanted to become an active member because the British Chamber is an organisation which links both sides of the Channel. Even though I have been a member for just under 2 years, I have seen a massive progression in the chamber. From my first meeting as Secretary in 2013, there was a focus on identifying issues in governance and organisation of the chamber. Glenn and Glynis have both completely improved these areas in the time here, not just the revamp of the website, but everything behind that – how we approach members, how we communicate to them. In essence, the chamber has professionalised its workings, and the rightfully ambitious plans that Glenn has for the chamber each year have massively improved the way in which the chamber runs. It’s difficult to highlight only one event or activity which has been a highlight so far. If I had to pinpoint something it would be the workings of EXCO – essentially the driving force of the chamber. It brings together motivated people, dedicating their own free time to improve the chamber and its running. The sheer commitment to ensure the progression of the chamber is impressive, not just the breakfast and lunch events, but how it communicates and organises itself. The cherry on top of the cake will definitely be the Ambassadors’ Gala which is coming up this year and what I am rather excited about. Therefore, my highlight, and what I would like to point out most, is the governance and running of the chamber – I get to see into the running of an organisation like the British Chamber; one I would never have got to see before in my work as a lawyer. The benefits of being a member is that it took me out of my regular work context. For most members of the chamber, there is a direct professional, business interest in joining the chamber. But for me, it was mostly to get away from what I know (legal and law) and push myself into a world I didn’t know. I got to see things in different ways – mixing with consultants and big corporates, I got to see how different policies impacted these companies and how important things were that never before crossed my mind. 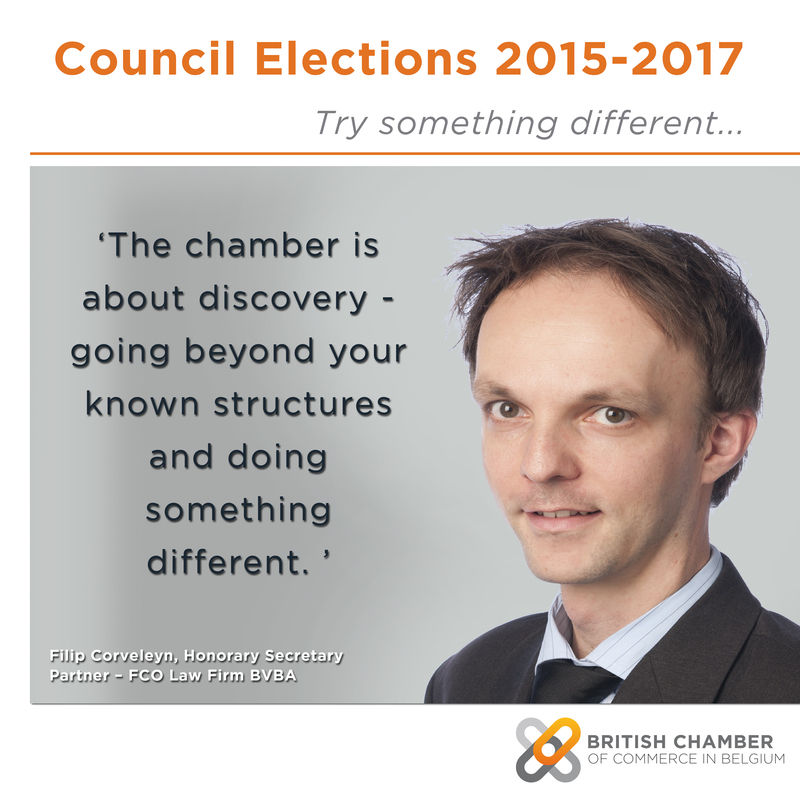 The chamber is about discovery – going beyond your known structures and doing something different. The diversity of people in the chamber, and around the table at EXCO and Council – the business link, the EU link, and also the social link – it is an interesting dynamic to work with. Being a lawyer and working in an environment sharp and hard, being part of the British Chamber has been an interesting learning curve. I really appreciate the way the chamber is governed and the way it is run by the whole team, but also by the volunteers from member organisation who dedicate their own time to the smooth running of the chamber too; this is the common goal that everyone is striving to achieve and that’s why the chamber works so seamlessly.